OCEAN TRANSPORT COMPANY RTM LINES ANNOUNCES NEW BRANDING, WEBSITE AND FUTURE PLANS. (November 20, 2014, Norwalk, CT) – RTM Lines, a world leader in ocean transport and logistics announced today a bold new branding initiative including a new corporate identity, advertising campaign and a comprehensive redesign of the RTM website. The website allows customers to find solutions by industry, get routing and scheduling information and check the status of their shipments. RTM was founded in 1980 and has built an international reputation providing innovative routing, in depth expertise across a wide variety of cargo types including highly complex shipments, an impressive on-time delivery and safety record and continuous emphasis on exceptional customer service. 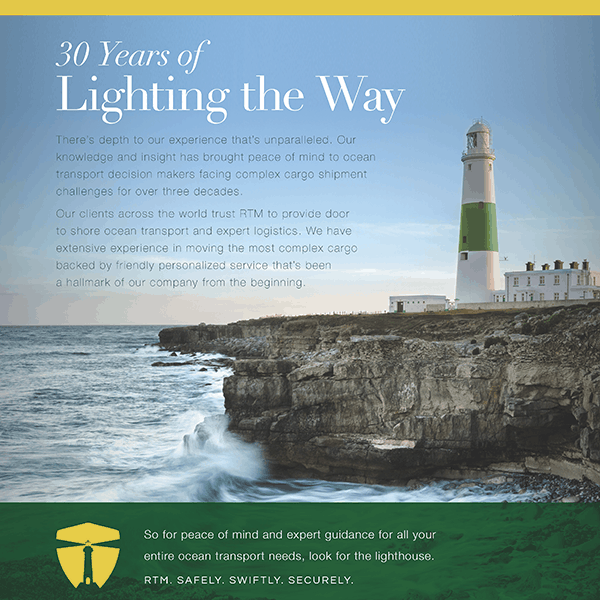 The company also debuted a new advertising campaign featuring the theme “Look to the lighthouse.” The ads feature photography of a lighthouse atop of rocky hilltop casting its beam across the ocean as a symbol of RTM’s on-going promise of providing guidance and assurance to ocean transport decision makers seeking peace of mind amidst the stress of shipping expensive cargo across the world.